Click here to see the process! 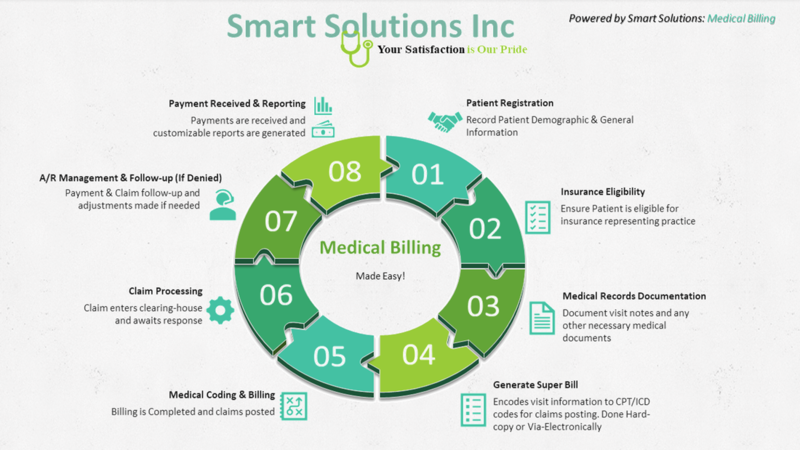 Smart Solutions understands clinic’s organizational structures and the difficulties provider’s face in managing independent practices (PCPs, Specialists, and Allied Health). It can become challenging to not only provide quality patient care, but to also manage business aspects. We can conduct medical billing precisely, outreach and retain targeted patients, as well as analyze patient trends and healthcare insurance plans. We are well experienced in in-patient attribution and share saving programs offered by commercial and governmental payers (Medicaid & Medicare). Smart Solutions has 25 years of IT & Healthcare analytical experience. We are well acquainted with the Healthcare industry and its developments, including patient & private policies (HIPAA), clinical regulations, insurance plans, accreditation and PHO affiliations. Combining our healthcare knowledge with our IT skills can help you increase efficiency, productivity, & generate effective work through automation of manual processes which can reduce paper work, room for errors, and the need for employees’ fluctuation.